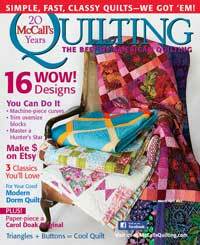 I'm so happy today to tell you I have a quilt in the March/April edition of McCall's Quilting magazine! This quilt combines my favorite things - solid fabrics, over-the-top quilting and a great back story! 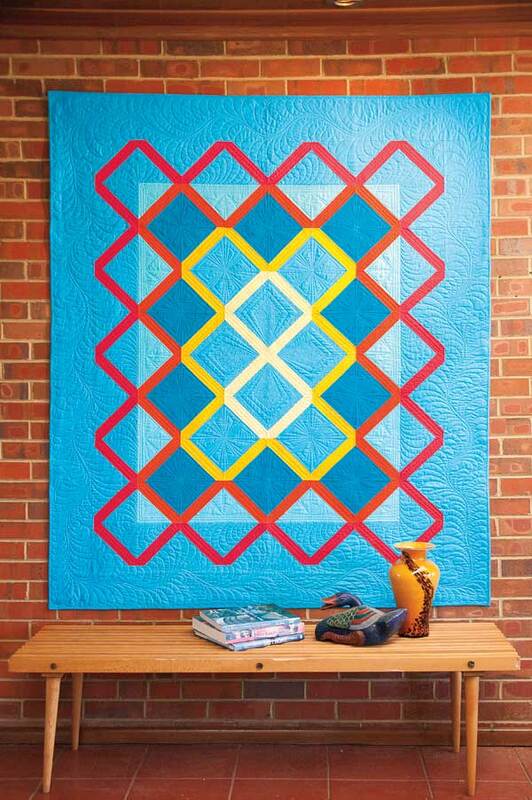 The design is inspired from an Amish quilt I saw in a book - American Quilts: The Democratic Art by Robert Shaw. 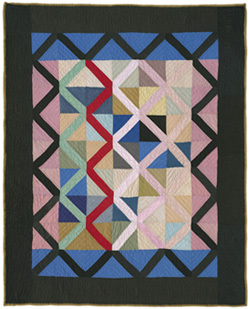 The version in the book is called Lattice Crib Quilt c. 1930. I was drawn to it for its Gee's Bend quality - no discernible plan to it but somehow it's cohesive anyhow - and so darn appealing! I am drawn to chaos, but I just can't seem to translate that into my quilt designs. My designs are ordered and well planned. I think I get that from my dad - nothing less than perfection is acceptable! But I love looking at these old, wonky quilts and drawing inspiration from them even if mine end up looking nothing like the original! My version uses the same block but that's where the similarity ends! I dug though my solids looking for color combinations that look good to me. I'm in love with blue right now, so I knew that would be the main color. I chose 3 gradations: light, medium and medium-dark. To offset the calming quality of that much blue, I looked to the opposite side of the color spectrum - to the warm colors. I chose red, orange and two shades of yellow. These warm colors give just the right balance to the cool blue. Haven is made from just one block - only the color combinations change. Haven is totally balanced, meaning there's nothing wonky or "off" about it. That lead to the fabulous quilting. It was done by Angela Walters and is a wonderful blend of modern and traditional. I love dense, overdone, over-the-top quilting! Angela's has the unique ability to analyze a quilt top and see quilting patterns that others don't see. She created a medallion look to the open spaces in the center four blocks and repeated the same pattern, only smaller, surrounding that. It creates the illusion that the blue squares are the blocks and the red, orange and yellow stripes are sashing - totally hiding the true block. I love that! The borders are quilted in a feathered design, which has always been one of my favorite quilting patterns. Although not very popular in modern quilting, I still love them and use them whenever it makes sense. Here the curvy, feminine feathers contrast with the rigid, angular shapes of the blocks giving some balance to the quilt. And what's the great back story? I was instantly drawn to the Lattice Crib Quilt when I saw it for all its visual qualities, but what really made me fall in love with it is the little detail mentioned in the one-paragraph description: made in Haven, Kansas. That's the small, south central Kansas town, 200 miles from here, where my husband went to high school 30 years ago! What are the odds that this anonymous Amish quilt from a town of 1,200 could find its way to me? That's how Haven got its name - Haven to honor the original and Haven meaning home! If you want to read more about this quilt, head over to Pickledish later today. And Angela is talking more about the quilting at Quilting is my Therapy for those who want more insight into her design process. And of course, you can buy your copy of McCall's Quilting with instructions to make your own version of Haven! Congrats Jenifer! Haven is gorgeous. I love it. Great story. Congratulations, Jenifer! Haven is a fantastic quilt! I love the way you blended the serenity of the blues with the orange/red and yellow to spice it up a bit. Jenifer your quilt is gorgeous! You definately have the eye for design and color, and I'm a quilt-o-file myself, are you planning on writing a book? Beautiful quilt. I just love it. Any chance that you remember which Kona cottons you used?